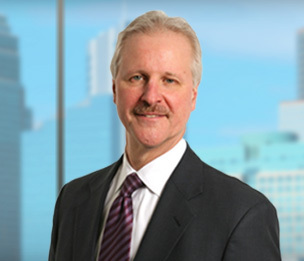 David P. Graham is a member of the Products and Professional Liability Practice Group in Dykema's Minneapolis office. Mr. Graham defends products liability litigation for clients in the pharmaceutical, medical device and food and cannabis industries. He leads the firm's Food & Beverage Industry Group. He also has experience defending health care clients in False Claims Act cases, government investigations related to allegations of fraud and long-term care malpractice claims. Mr. Graham has represented clients in multi-district litigation, class actions, and consolidated state court proceedings, as well as FDA and USDA food labeling, advertising and safety matters. Mr. Graham has defended companies in employment termination and discrimination cases. He has litigated and tried several cases to verdict in state and federal court. Mr. Graham is a member of Dykema's pro bono committee and has been on the benefactor board of the Volunteer Lawyers Network in Minneapolis. In addition, Mr. Graham teaches Food Law at Mitchell Hamline School of Law. "Straight Talk About the Food & Beverage Industry: Inconsistency with a dash of rigor is a bad regulatory recipe for manufacturers"
"American Meat Institute v. United States Department of Agriculture: country of origin labels and the First Amendment"
"Questionable Consumer Fraud Cases in Food Industry"
"The Fight Over Food Labeling and Free Speech"